GoXtra News: Ms Cosmo and Tshepiso Ramotsehoa at the forefront of the 2013 One Young World Summit! Ms Cosmo and Tshepiso Ramotsehoa at the forefront of the 2013 One Young World Summit! 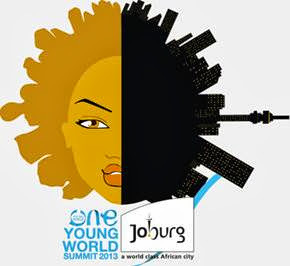 The fourth annual One Young World summit will run until 5 October 2013 at the Sandton Convention Centre. The OYW summit will gather over 1,300 young future leaders from 190 countries who will share their visions, views and ideas to create practical and achievable commitments for positive change. OYW delegates will speak alongside respected global figures such as: Kofi Annan, Arianna Huffington, Antony Jenkins, Ahmed Kathrada, Paul Polman, Muhammad Yunus, Ron Garan, and Boris Becker, just to mention a few. Ms Cosmo and Tshepiso Ramotsehoa have been selected by the City of Johannesburg to represent South Africa as spokeswomen for the country. This is the first time that the OYW summit is being hosted on African soil and both Ms Cosmo and Tshepiso Ramotsehoa who have attended previous summits abroad, once and twice respectively, are very happy and proud to see the summit being held in South Africa on their home turf. “I'm blessed to be part of an organization that brings young thought leaders into a space that allows us to come up with real time solutions to the world’s problems” shares Thepiso Ramotsehoa. "Being part of One Young World is a challenge. A challenge to all young people in the world to make a change for the better of their communities, countries and the world. Being part of that gives every young person involved an opportunity to be part of something great for the world over. I'm excited that OYW is in Johannesburg this year because Africa can be viewed in a different light, showing its beauty, hardships and challenges. I love a great challenge and I love being part of OYW" expressed Ms Cosmo. The summit will be made up of interactive sessions including topics on education, global business, health, human rights, leadership & governance, sustainable development and transparency & integrity.